S-Pulse win 4-2 on agg. Urawa came looking for goals, but their confidence was shattered in the very first minute when Abe, under no pressure at all, managed to slice a Johnsen ball straight into his own net. 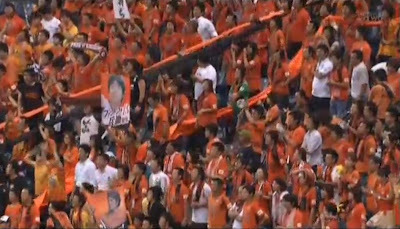 The S-Pulse masses went mad, the Urawa travelling hordes were stunned into silence, and you just kinda knew it was going to be our night. Yes! And you're out the cup! The Reds had the better of the chances for the rest of the first half, but Kaito was rarely called upon to make any real stops. Urawa were without Tulio, and they missed him. Edmilson was a danger up front, but he was unable to create anything of any real substance and soon was whining and moaning to the ref about every little decision.The away fans had bafflingly booed Okazaki tonight, presumably for no other reason than they knew he was a huge threat. He proved their point perfectly, when in 1st half stoppage time he rose to slam home an excellent cross from the left. He doesn't make mistakes with these and when the ball nearly burst the net, the boos were silenced and the other three sides of the stadium were sent into raptures. Another semi final here we come! At two nil, even just one goal from Urawa would have sent the game into extra time. However, a free kick just past the hour was headed back by Iwashita and met by Aoyama, who claimed his second goal in two games, and that was that. The wind was taken out of the away team's sails, and while they kept huffing and puffing, the number of mistakes they made went through the roof. We almost made it four through Hara a couple times, and the visitors did manage to draw an excellent save from Kaito around 85 minutes, but 3-0 is how it stayed. 4-2 on aggregate, and we make our second league cup semi final running. Great work lads - an excellent night under the lights, and we're now only two legs away from a chance to banish last year's Kokuritsu nightmare forever!! A few vids today. First, a round up of all the quarter finals. S-Pulse come first. A personal cam of Okazaki's stunning header which put us 2-0 up. The same cam captures Aoyama's goal which made it three nothing. A video taken by your own UK Ultras reporter directly following Okazaki's goal. The last minute of play and celebrations. Click here for full information on this year's Nabisco Cup. 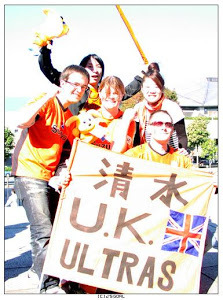 I didn't go up to Chiba for this one, although our travelling army was out in force as ever. I also didn't see it, on account of being in Kansai for the weekend. I got back late last night, hence the late update to the site. While I was over enjoying Universal Studios, the boys were doing the business grabbing another vital three away points. Okazaki and Johnsen demonstrated their increasingly deadly partnership to open the scoring. JEF levelled in the second half with a cracking goal from Fukai before Aoyama connected with a long free kick to grab a rare goal, and what turned out to be the winner. With many teams above us dropping points, we could make up some ground on the top five. Next up is Urawa in the league cup before facing them again next Sunday in the league. They've lost their last two, away to bottom of the table Oita (who have lost 15 from their last 16) and they got spanked at home 3-0 by Nagoya on Saturday, so it's as good a time as ever to play them. Click here for the full up to date league table. Our match with Albirex Niigata in a fortnight is going to be a huge yardstick as to how we can expect the second half of the season is going to go. Compared to last year, we're well placed and have it all to look forward to! And finally, a video of part of the excellent Hollywood Dreams rollercoaster at USJ. Wow. What an eveing that was! There wasn't a spare seat in the house to witness a roller coaster of a game, and to see S-Pulse extend their unbeaten streak at home beyond the year point. We should have won this. Iwashita, a player I've got a lot of time for, made two absolutely shocking errors to give the champs a two goal lead. Well at 2-0 down to Kashima it was always going to be an mountain to climb to get back ino the game, but our boys were more than up for it. Even given the huge knock our confidence took to be 2-0 down when we should still have been level, we rallied and came back fighting. Okazaki connected to a Johnsen cross with a world class header to claw one back right before the break. Ten minutes after the restart, Johnsen also slammed a header home to level and send the packed stands delirious. We went close to a winner on a number of occasions, but it wasn't to be. Kashima equal their own record of 16 games unbeaten, and we fall further off the pace of the ACL spots. Well, given everything, it wasn't a bad evening at all, and for pure entertainment, one of the best games I've seen for a long time. Iwashita came over after the game for a personal apology, and we all appreciated it, but don't dwell on it, fella. We're all human, and you've more than made up for any mistakes this season already with some excellent performances! Onwards and upwards - JEF away next week and three points is a must! There were less than 1000 tickets left for this one as of yesterday afternoon, so it looks ike a bumper crowd down 'Daira this evening. Kashima, as you might expect, are the team to beat this year. They've lost only once all season, and that was way back in week two. Since then, they've won twelve and drawn three as they've strode relentlessly towards a third stright title. Well, they may be eight points clear at the top with a goal difference better than anyone else, but we're only half way through the season, and as we all know, S-Pulse only seem to perform in the second half of the year. The majority of those wins have been by a slim one goal margin, and we're unbeaten at home in the league for over a year, not to mention we sent them packing last year, so bring it on! Well, anyway, I should start thinking about getting down 'Daira. I'm updating from an internet cafe on account of my ten month old Sony Vaio dieing this week. Estimated fix time: three weeks. It would probably be be quicker to build my own computer out of used cereal boxes and sticky back plastic, but seeing as it's still in warranty, I'll let the bods at Sony repair their faulty goods. Until then, updates may be sporadic, so bare with us! Right, I'm off down Nihondaira for some fun under the floodlights. Laters. Half time: 1-0 down to a dodgy penalty. Haraguchi had already fallen half over before he hit Paulo's legs. Well played, you cheating scumbag. Full time: 2-1 to Urawa. Had the penalty not come from the 18 year old Haraguchi tripping over his own feet, I would say it was probably a fair result. Dodgy penalty for the home team saw them one up at half time, but they certainly had the better of it in the first 45. In the second half we got one back through Edamura before a cracking shot from Mr. Handsome Tulio came back off the bar, only for Edmilson to head it home (completely taking out Iwashita in the process - wish we'd had the same ref who penalised a shoulder barge the other week...) . 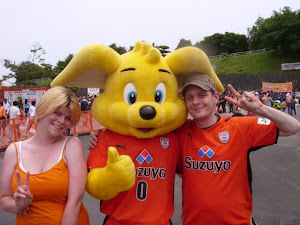 We went close to an equaliser through Okazaki which needed a last ditch block from Abe, a Jungo free kick which brought a fingertip save from Yamagishi, and an Iwashita header from one of our six corner kicks (more than the home team) which needed an excellent one hand save to deny us. Well, it's always a struggle playing against dirty opponents, but Edamura's absolute beauty just after the restart means a 1-0 win on the 29th will be enough to see us through. That said, a draw is no good, and even a win higher than 2-1 of a one goal margin won't be enough (3-2 / 4-3 etc), so all told, it's not a great result tonight. Ah, well, sod it. We'd have had to have gone into the second leg looking for a win anyway, and it could be worse - Forgetting Nagoya's capitulation tonight for a minute, Gamba got done 3-1 at home. This means they need to win three nil away to save their rapidly disintegrating season. Looking at the other 1/4 final first leg results, out of the four teams that lost, we're in by far the best position. See below for more info. Click here for a round up of the other results in the 1/4 final first leg. After the bitter disappointment of last week I couldn't help but wonder if, even at three nil, Gamba were going to let us out of Kansai will all three points. I needn't have worried so much. Despite Cho Jae-Jin giving the Asian Champs some hope, we went on to become the first team since Manchester United to put four past Osaka, and at the same time get our league campaign back on track. The scoring was opened at the end of a frantic first 15 minutes with both teams setting their attacking stall out. Okazaki showed his class to grab his eighth of the season by knocking a Johnsen through header over an advancing Matsuyo. He was under intense pressure from Osaka captain Yamaguchi, but held his nerve to make an excellent finish; a classic poacher's goal. 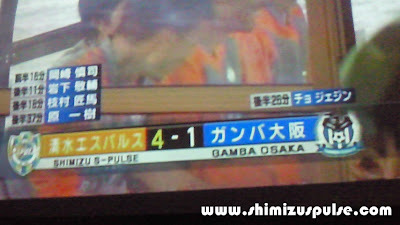 Not too long later, Gamba had the ball in the net, but only after a clear handball. It was just as well, as Kaito was rolling around in the net having prevented a goal direct from an excellent corner kick. Despite Gamba applying long periods of sustained pressure, we managed to get to the end of the first half with the score still 1-0. The difference was Yamamoto back in goal, who is head and shoulders above the shaky Nishibe. He turned 24 today and has a long, bright future ahead of him. On to the second half, and it was our corner weapon Iwashita who slammed the ball home on the volley to double our lead and send the travelling masses into raptures. Less than ten minutes later Edamura made it three, from another Johnsen assist. With Gamba throwing everything at us, they were left fatally exposed as Edamura made his way out wide left. He made no mistake in smashing it past Matsuyo. Eight minutes later it was with glorious inevitability that ex-Pulser Cho Jae-Jin should pull one back for the home team. The big man was only brought on in the 58th minute for Lucas, but didn't waste time in getting his eighth of the year. He connected with a pass from Leandro who took time out from flopping around on the floor to create a decent chance. The nerves many of us were feeling given last week's capitulation only lasted ten minutes. Substitute Hara displayed his deadly finishing having sped behind the hesitant blue and black defender to fire it past Matsuyo. In doing so, he pushed the game beyond any doubt and gave us ten minutes to enjoy our destruction of the reigning Kings of Asia; the first time we've beaten them away in the league since 2001. 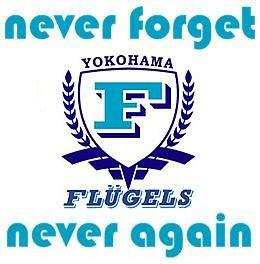 We were outshot 18-8, and without Yamamoto's steady hands in goal Gamba would surely have clawed more goals back. However, as time began to run out, the hosts were reduced to increasingly speculative long range efforts which didn't cause us many problems. It was a fantastically decisive finishing display, and one which can give us confidence going into next week's clash with defending champions Kashima. The Antlers won yet again today and are looking pretty much unstoppable on their march to a third straight title. Come on then, lads - be the first team to knock them off their perch since week two of the season! As for today, I regretted that I wasn't able to make it over to Osaka for this excellent result, but the Dream House put on a great event tonight for a near full house. It's Urawa in leg one of the cup 1/4 final on Wednesday before Antlers on Saturday. If you've got a moment to catch your breath during all this excitement, don't forget that tickets for the derby (August 22nd) go on general sale next Sunday, July 19th. This game will sell out, so get yours early! Official pictures can be found here (top row). The report from The Rising Sun, along with those for all other J1 games, can be found here. Full highlights of a virtuoso performance from our boys in orange, with a special mention for our man in green. Awesome display, Kaito! Here's also a nice clip of our travelling hundreds who, as always, did us proud. For reasons unknown, we had no band for this game. You don't have to understand Japanese to see he's getting a pretty hard time! The last minute from behind the goal. Includes the unfathomable free kick which was moved twenty yards up the pitch by the keeper, and led directly to the equaliser.